OLDHAM’S sleeping giant was awakened in the most spectacular outdoor show ever hosted in the borough to celebrate the Old Town Hall Cinema opening. Oldham Theatre Workshop and Arts Development team has worked incredibly hard to create a spectacle and a show that symbolises our pride in Oldham as a place, and our confidence in our future. 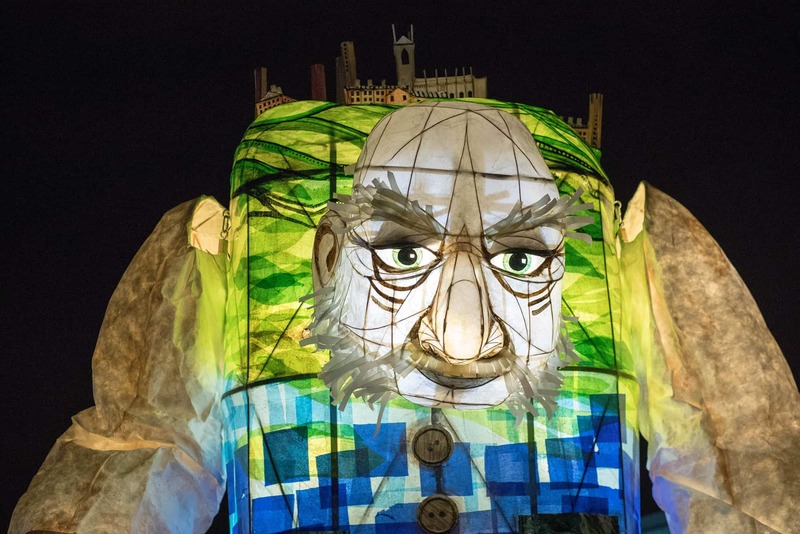 This fantastic event ‘On the Shoulders of Giants’ takes its inspiration from a local legend – the Oldham Giant – who is buried in the crypt at Oldham Parish Church. This was a man called Joseph Scholes who died in 1814 and is said to have been around 6ft 7in tall and weighed 37 stones when he died(!). He was, however, a ‘gentle giant’ who spoke up for apprentices who were recruited from the workhouse and found themselves bullied and underfed by fustian weavers.